"How the Twenties Roared in North Carolina"
With more money in their pockets, many North Carolinians believed that the 1920s would be a decade of economic growth. On the promise of prosperity, people bought cars and radios or took trips to the state’s new hotspots, such as Asheville. For others who longed for goods advertised in national magazines, the 1920s meant Listerine, makeup, rayon dresses, or vacuum cleaners that could be purchased in New York City, Chicago, or Raleigh. The 1920s marked the advent of voting for North Carolina’s white women. It also meant bobbed hair, short skirts, and cigarettes. For the 75 percent of the state’s population who still lived in rural areas, these images served as evidence of both the decline of traditional values and the growing distance between urban and rural America. The Roaring Twenties was a time of change for many North Carolinians who moved to cities and towns across the state. For most, however, it was not an era of prosperity. The Roaring Twenties was also a decade of mixed blessings for black North Carolinians. Urbanization did provide new opportunities for African Americans. Many welcomed the jobs that the tobacco industry offered. They did not find jobs in the textile industry, though. In efforts to promote the textile industry in the New South, boosters had promised that the benefits of industrialization would go first to whites. As a result, frican Americans were largely banned from textile work. As continued victims of a Jim Crow system, they suffered the economic costs of another decade of racial segregation. To make matters worse, the Ku Klux Klan experienced unprecedented growth, and violence remained a fact of African American life in North Carolina. At the time of this article’s publication, Dr. Elizabeth Gillespie McRae was an assistant professor of history at Western Carolina University in Cullowhee. Duke University Archives. February 27, 2008. "Main Entrance Duke, ca. 1925." Located at http://www.flickr.com/photos/dukeyearlook/2312300967/. Accessed February 24, 2012. 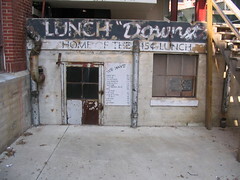 April 27, 2007. 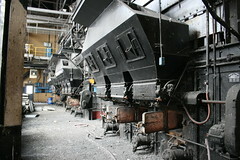 "Furnace in abandoned Burlington Mills Plant." Located at http://www.flickr.com/photos/29158681@N00/1062095111/. Accessed February 24, 2012. August 9, 2009. Tobacco District, Durham, North Carolina. http://www.flickr.com/photos/mrjincks/3806917122/. 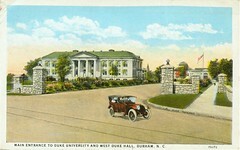 "Durham # 17. "Accessed February 24, 2012.